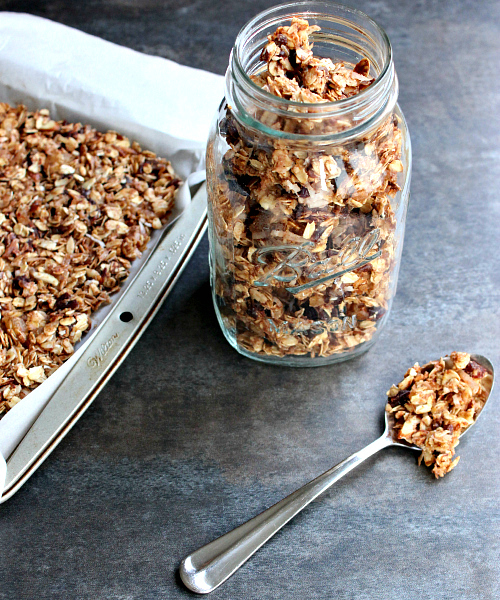 i know that title is a mouthful, but wait until you get a mouthful of this granola! i am totally obsessed with granola. i love to eat it plain as a snack, mixed in with yogurt, on top of ice cream . . . really, any way i can. most types of store-bought granola aren't too bad (i love trader joe's granola) but nothing beats homemade granola. i have made many different types of homemade granola (hello, peanut butter granola!) but by far this recipe has got to be my favorite so far. i've made this recipe twice, and it is so incredibly good. 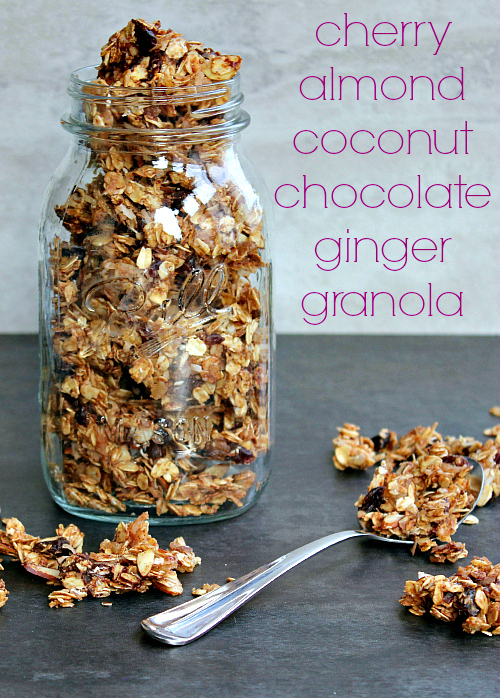 the combination of flavors in this granola is out of this world. it is chock full of so many delicious ingredients: old-fashioned oats, dried cherries, sliced almonds, coconut flakes, 60% cacao bittersweet chocolate chips, crystallized ginger, and cinnamon. all of those yummy dry ingredients are held together with honey, almond butter, and coconut oil. this granola is down right dangerous to have around the house. i just can't get enough of it. every time i walk by the refrigerator, i grab a handful. 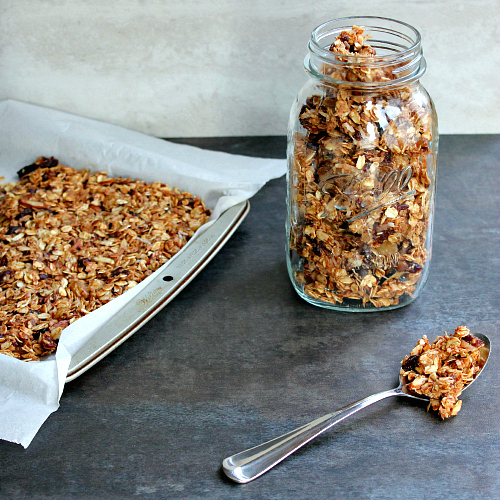 needless to say, a batch of this granola doesn't last very long in our house! 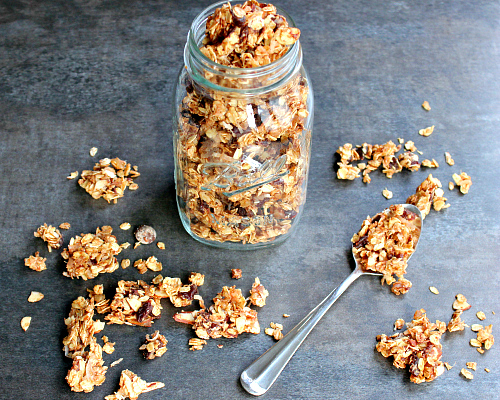 if you are a granola fan, you have to try this recipe. you are going to love it! in a large mixing bowl, combine the oats, chopped cherries, sliced almonds, coconut flakes, chocolate chips, and chopped crystallized ginger. set aside. in a medium sauce pot over medium-low heat, combine the honey, almond butter, coconut oil, sea salt, and cinnamon. stir constantly until the mixture is hot and all of the ingredients have evenly combined. remove from the heat and let cool for several minutes. pour the sauce into the dry mixture. stir thoroughly until all of the dry ingredients are evenly coated. 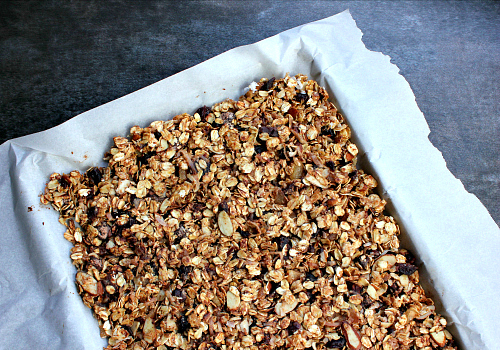 press the granola into an even layer on a baking sheet lined with parchment paper. refrigerate for 1-2 hours. break apart into large pieces. store in the refrigerator. That would taste good on my yogurt. Mmm ... I love the combination of ingredients you chose (many of my favorites)! Thanks for sharing!